Over on “Towards an Archaeology of Iconoclasm“, Troels mentions a new study by Jakob Munk Højte on Roman imperial statue bases. Troels then goes on to the question of the mutilation of inscriptions, and mentions a case in the Prytaneion (presidency building) at Ephesus which involves the obliteration of the goddess Artemis’ name (probably by Christians). Troels also promises some more entries on the topic, to which I will look forward. Troels also mentions the relative commonality of the erasure of an emperor’s name in cases where an emperor was so disliked by other senators that his memory was “condemned” (damnatio memoriae) after his death. 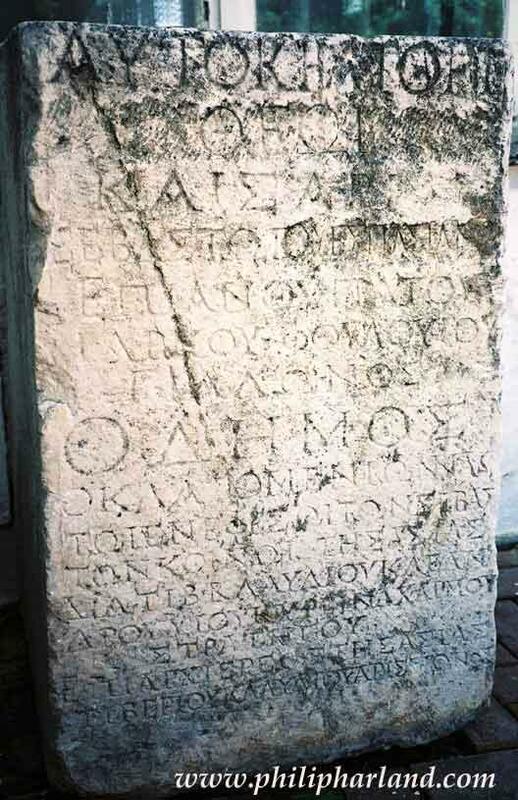 I happen to have on hand a photo of an inscription, now in the museum at Ephesus, that involves a dedication to the emperor Domitian in 88-89 CE (by the city of Klazomenae) (IEph 235). After the condemnation of Domitian’s memory, Domitian’s name was erased and the monument was rededicated to the emperor Vespasian. The erasure and re-inscription took place on lines two and four, with Domitian being replaced with “god” (theos) in line two and Germanicus being replaced with “Vespasian” in line four). You can also check out some other monuments and statues in the Ephesus museum, as well as other Turkish museums, here. UPDATE: Welcome to readers of Respectful Insolence (aka Orac Knows), a blog by an “academic surgeon and scientist” that covers just about everything you could imagine, including science and history (especially WW II and the Holocaust). If you are interested in Roman history and the history of religions in the Roman empire (including Judaism and Christianity, of course), you may (are sure to) find other entries of interest here. Categories: Archeology and epigraphy, Emperor worship, Epigraphy series, Greco-Roman religions and culture. September 3, 2005 .